The fidget spinner craze is definitely burning hot right now. Everyone seems to want to be spinning some plastic between their fingers. Recently, NHL bought one for himself on a school trip to Montreal. JSL was a bit jealous and wanted one for himself, but no one seemed to have any in stock. What to do? Easy. Build our own! 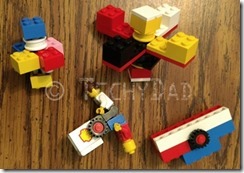 After a bit of Googling, I found a blog post with instructions on building our own fidget spinner from Legos. One problem: Despite having a giant bin of Legos, we didn’t have most of the parts we needed. So we improvised. We rooted through the bin for wheels and other pieces that would work. After a few minutes, both JSL and I had a working fidget spinner. JSL then went on to build two more. At this point, I decided that I needed to share. I made a video and posted it on Instagram showing off my creation. I made a #Lego fidget spinner. JSL presents the three fidget spinners that he made out of #Lego. I’ve since disassembled and reassembled my Lego fidget spinner so I can document the process. I leave it here, not as hard and fast instructions, but as a guide. The fun part about making a Lego fidget spinner is making it your own. Sure, it might not spin as fast or as much as the real thing, but half of the fun is building and customizing it.